The Newfoundland is one of the biggest dog breeds in the world, but it’s also one of the most docile. This makes it a great pet for families with small children. That’s if you have the space for this gentle giant in your home — and are willing to have an oversized furry friend in your bed or on your sofa on a regular basis. But, even when you read how big they are, sometimes you need some visual evidence to truly understand the stature of these beautiful pups. We found some impressive pictures that show just how huge Newfoundlands (also known as Newfs or Newfies) really are. Many Newfoundlands have their own Instagram accounts, like Gongolo, who lives in Japan with his devoted human. Born in January 2018, he may still have some growing to do — but he’s already way bigger than his best friend! FYI, a fully-grown male Newfoundland typically reaches a height of 28 inches and weighs up to 150 pounds — heavier than some adult humans. Peek, from Notta Bear Newfoundlands, took part in Kelly Pratt and Ian Kreidich’s “Dancers and Dogs” photo project, posing alongside Los Angeles-based dancer Maxine Hupy. You can see how the dog pretty much dwarfs Hupy. The project, which went viral in March 2018 and aims to photograph 100 dancers and dogs, started with Ericka and Baxter, an English Bulldog. “Ballet is often seen as stuffy or unapproachable, and we feel like this project helps people see the lighter side of dancers,” wrote Pratt. 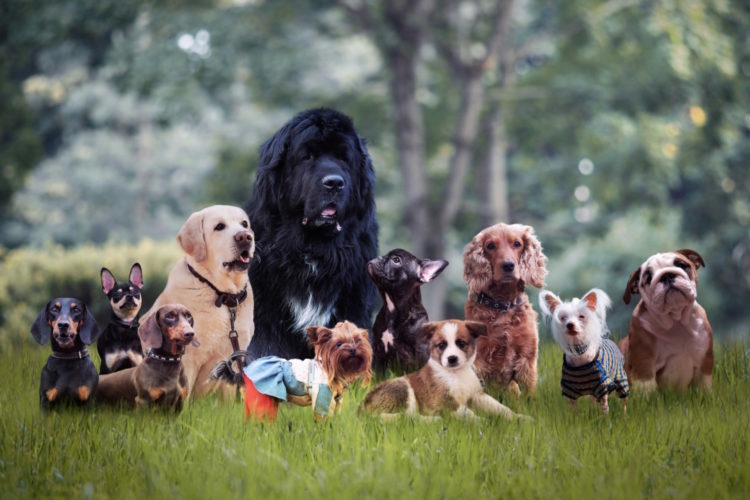 The Newfoundland was first bred on the island of Newfoundland, which is off the east coast of Canada, after its ancestors were likely brought to the area by European sailors during the 1400s. 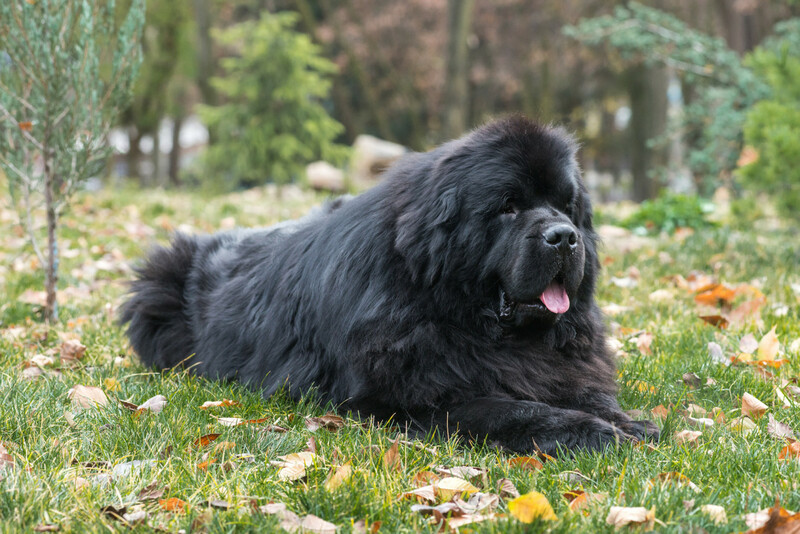 While the exact lineage of the breed remains a matter of great debate, many people believe that the European dogs were crossed with local dogs to create the modern Newfoundland. Notta Bear Newfoundlands’ handler, groomer and trainer, Bethany Davis, celebrated the success of The Kid, a gorgeous Newfie who scooped three medals at his first major at 15 months old. According to American Kennel Club, the Newfoundland is known for its gentle, loyal and sweet nature. This is not a watchdog breed — it’s more interested in welcoming newcomers than scaring them off — but it is protective of its loved ones and may alert them that someone is approaching by barking. Overall, the Newfie is a happy, laid back dog that adapts to its environment extremely well (there’s no doubt that Bhaaloo looks pretty content on this bench, which he can pretty much cover on his own). Historically, Newfs pulled in nets for the island’s fishermen as well as other heavy work such as pulling carts and hauling wood; their large jaws and strong heads make these tasks easy. They can also be used as pack horses, as they’re strong enough to carry numerous items on their backs. Their capability, enthusiasm, size and strength give them the edge is many dog sports, including obedience, carting and drafting. They are also great opponents in tug of war! Naturally talented long-distance swimmers, due to their lung capacity, broad chests and webbed feet, Newfoundlands are excellent water dogs. In fact, they often act as rescue dogs, as they are courageous and strong enough to pull drowning people to safety. 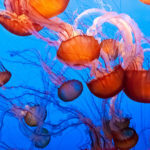 They can even endure very cold water, thanks to their oily double coats. But forget the traditional “doggy paddle” because Newfoundlands swim more like humans doing the breaststroke. As you can see, some Newfies, like Rosie, will settle for taking up an entire kiddy pool. Given their love of water, it’s no surprise that Newfies love to take a bath. But Quebec’s Elsa Kennel advises against over bathing this breed, because this removes natural oils and can dry out their coat and cause skin problems. Elsa Kennel recommends bathing Newfies only when they’re dirty, using a shampoo designed for dogs followed by a conditioning rinse to make brushing easier. 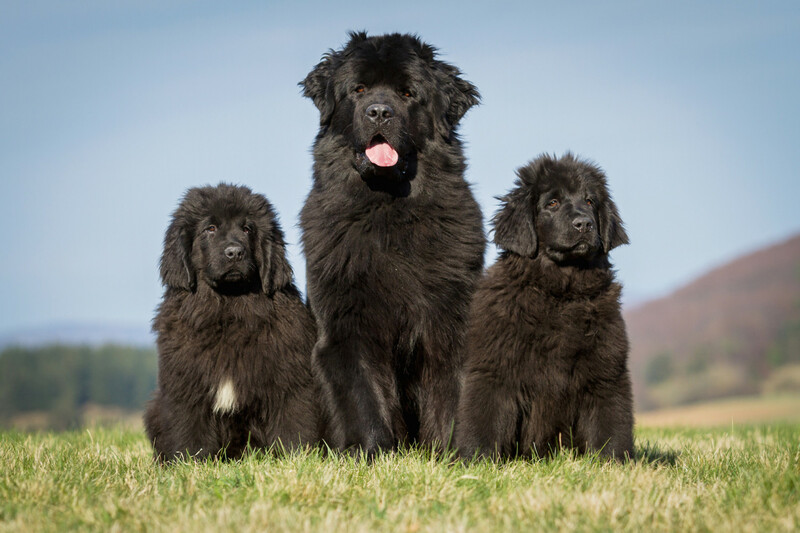 The American Kennel Club lists the standard Newfoundland colors as black, brown, gray and black-and-white. On the other hand, the Canadian Kennel Club says they can only be black or black-and-white. Like Phoebe, Newfoundlands grow quickly during their first year — from about a pound to over 100 pounds — and need lots of food. But Quebec’s Elsa Kennel warns against over-feeding a Newfoundland puppy, as this can lead to orthopedic problems. The Newfie has been the dog breed of choice for at least three U.S. presidents: Ulysses S. Grant, Rutherford Hayes and James Buchanan. Buchanan’s Newfie, Lara, was a celebrity around the White House because she would lay completely still for hours on end with one eye open and one eye closed, always keeping an eye on her human. Another famous Newfoundland owner was writer Emily Dickinson, whose Newfie, Carlo, was a gift from her father. 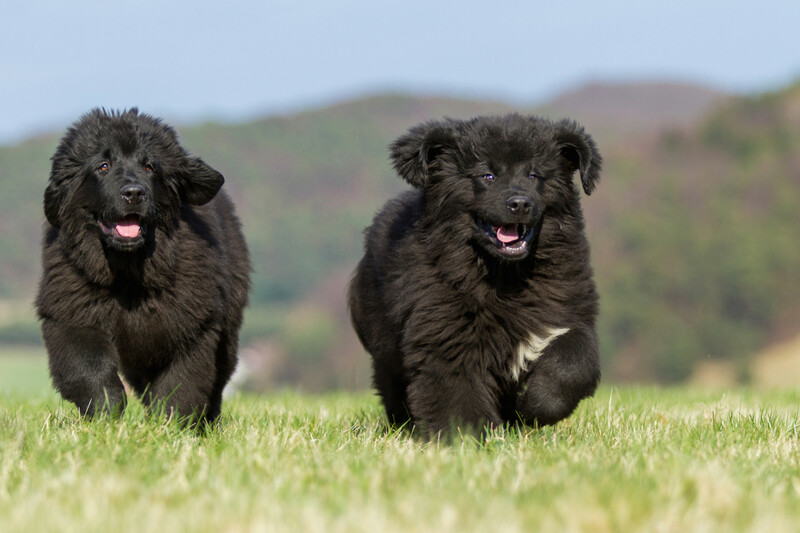 Male and female Newfoundlands are very similar in temperament, although dog expert and author Michele Welton says male dogs, in general, tend to be bolder, more aggressive and less prone to mood swings than females. The main difference between male and female Newfies is their size; females are typically smaller than males, weighing an average of 100 to 120 pounds when fully grown. Unfortunately, giant dog breeds don’t tend to live as long as smaller dogs. In fact, in a study published in The American Naturalist, researchers concluded that for every 4.4 pounds of body mass, a dog’s life expectancy is reduced by about a month. They don’t know exactly why this is the case, but it may be because larger breeds grow from puppies to adults rapidly, which may lead to a higher likelihood of abnormal cell growth (which may lead to cancer) or because larger breeds may succumb to age-related illnesses sooner. Healthy Newfies normally live from eight to 10 years, which makes four-year-old Saria middle-aged. Looks like she’s making the most of her years! The Newfie often gets mistaken for another giant dog breed, the Saint Bernard. They are both friendly, long-haired working dogs, but the Saint Bernard has a higher average weight (110 to 200 pounds), is much less likely to bark than the Newfie and is known for being a dry-land (rather than a water) rescue dog. Some dogs are a mix of the two breeds (known as a Saint Bernewfie), like Anabelle, who is a massive dog, as you can see. 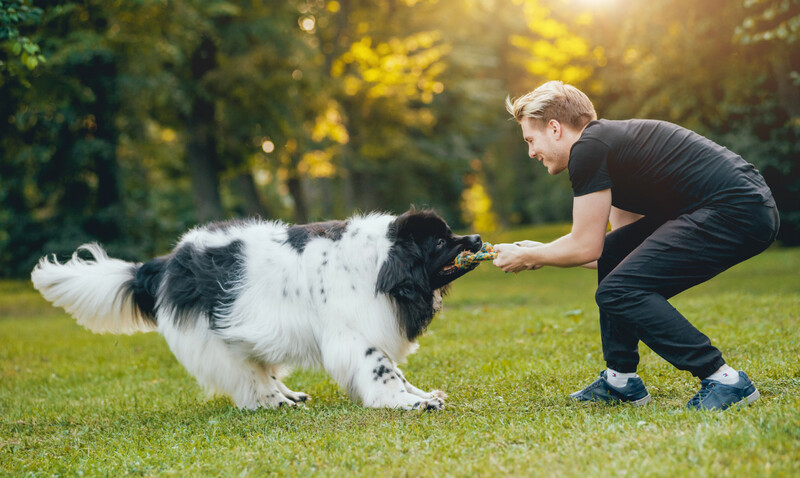 Newfoundlands are moderately athletic and need daily exercise (the American Kennel Club recommends at least half an hour of moderate, daily exercise for this breed), but they are also fairly docile, so being indoors is no problem. He does, however, need considerable space for exercise and ideally should have safe access to water. However, the size of the Newfie is a factor when deciding whether to make it part of the family. It should have daily walks, a run in the garden and as much swimming as possible to satisfy its desire to be in water. Newfies are obedient dogs and learn quickly, so it’s not too difficult to teach them basic manners. A commitment to puppy training is important, because bored, undisciplined Newfies who don’t get enough stimulation will find ways to occupy themselves that could lead to chaos, such as by chewing furniture and other household items. 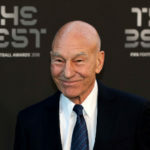 “You have to be consistent. Pick your training method and stick with it. 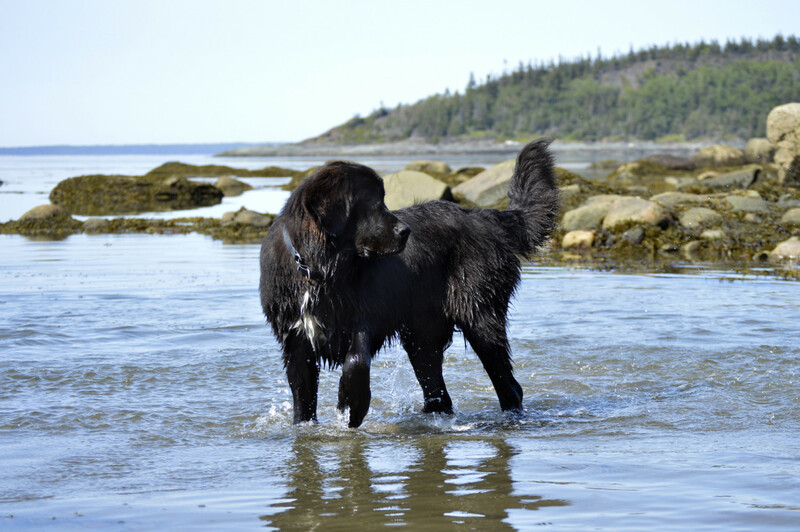 Make it a part of your daily routine,” writes Newfie owner and blogger Jennifer Costello. A well-trained Newfie will be a hassle-free companion at home and on the road, like Trudy. Newfoundlands are known for being gentle and easygoing, which means they get along with most other animals, including cats and other dog breeds. However, early socialization with other animals (as well as people, including small children) is important. “Some male Newfoundlands are aggressive with other male dogs, and a small few may be dominant-aggressive toward people,” writes Welton. Early socialization also boosts the confidence of naturally shy dogs. 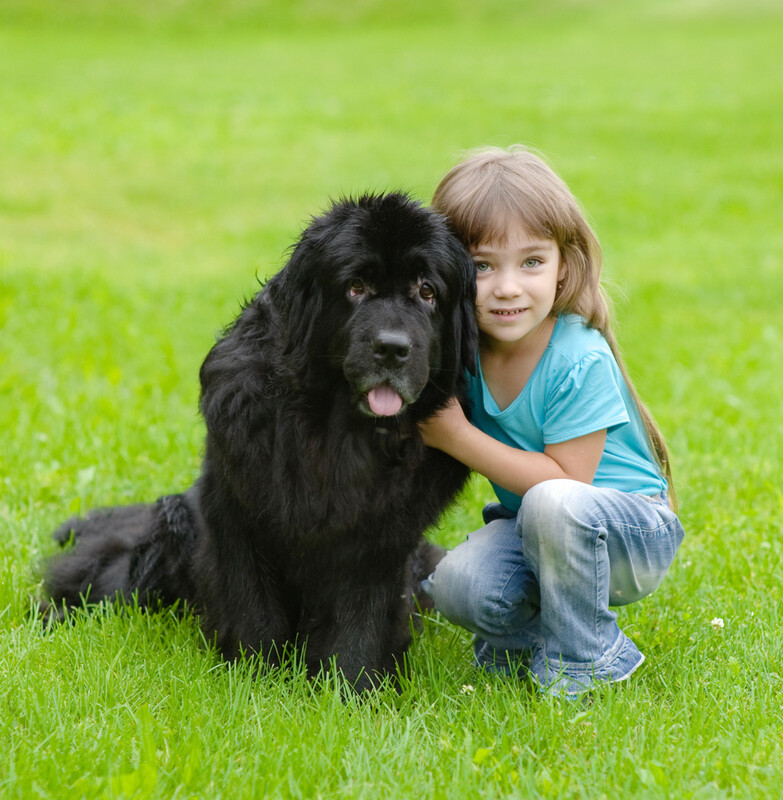 There’s no doubt that this breed can be a wonderful companion for kids, just like black Newfie Emilio, photographed below with his canine friend Camillo the Leonberger. Another great Newfie trait is its instinct to protect people while they sleep, and they don’t have any concept of personal space! This bulky, heavy dog takes up a lot of space in your home — and on your bed or sofa. 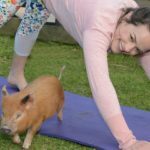 It might even want to lie on your lap, sit on your feet or lean its entire weight against your leg. Basically, it will do whatever it takes to stay close to you, as the giant black-and-white Newfie, Bear, demonstrates. While Newfoundlands are good-natured dogs, they’re certainly not pushovers. In particular, some male puppies can be extremely headstrong and need a firm hand during daily life as well as training sessions. It’s important to establish a leader-follower relationship with a Newfoundland from a young age. One of the most noticeable thing about Newfoundlands is their big, heavy coat, which makes them even bulkier than they already are. This needs a lot of brushing — not necessarily every day, but once a week at a minimum. It’s because of the heavy coat that Newfies aren’t comfortable in hot weather. If it does get too hot, their coat should be trimmed down, says Welton. As with all breeds, regular nail trimming is also important; overly long nails can cause discomfort and even lead to structural problems. Just check out the luscious coat on this pup, who makes her Yorkie-mix friend look like a toy! 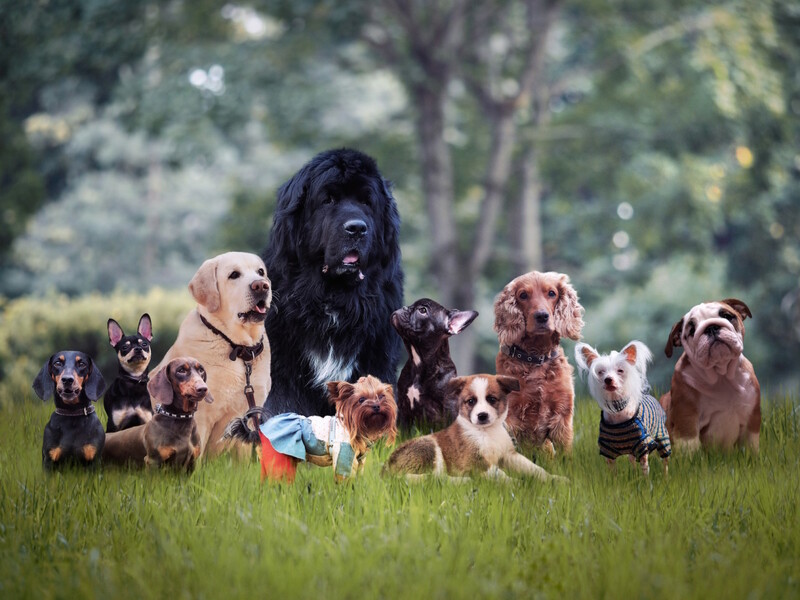 Like all dog breeds, Newfoundlands are prone to certain health problems. 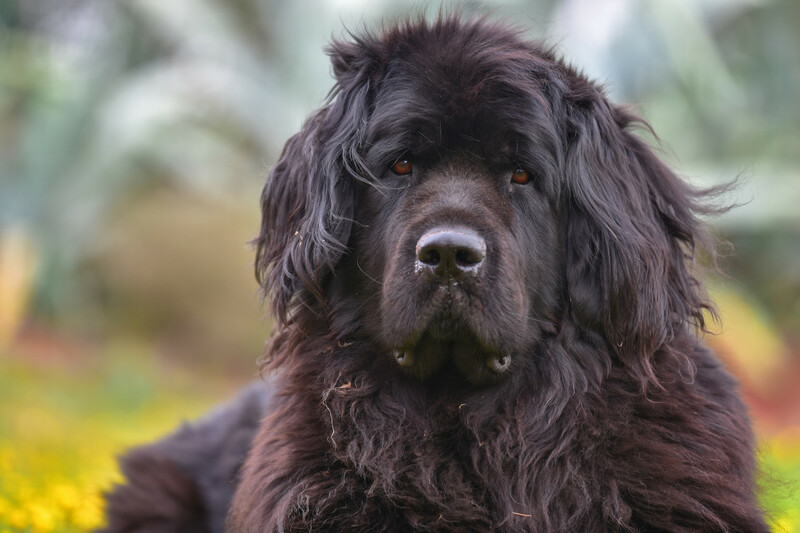 According to the American Kennel Club, Newfies may suffer from elbow and hip dysplasia, cardiac disease and cystinuria (which causes stones to form in the urinary system). It’s advisable to check their ears regularly for signs of infection, which are issues for all drop-eared dogs. Sidka, still a baby Newfie, looks very happy and healthy! Newfoundlands and other large dog breeds can experience canine bloat, also known as gastric torsion, which is a potentially fatal condition where the stomach distends and twists. 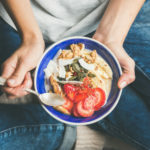 While the causes of bloat aren’t fully understood, experts advise feeding Newfies several small meals throughout the day and avoiding strenuous activity around mealtimes to reduce the chances of it happening. This sweet Newfy probably thinks his little sibling looks more like a treat than a fellow canine. It’s not just swimming that Newfoundlands excel at. This breed enjoys a wide range of activities, including agility, flyball, rally, tracking and herding. Another activity, dock jumping, combines the Newfy’s affinity with water and their athletic nature. One skilled Newfie is Ralphie, who is traveling with his human family through all 50 United States in a 34-foot RV. History is full of examples of Newfoundlands’ dedication to humankind. In 1802, when Lewis and Clark began their historic 8,000-mile Corps of Discovery Expedition (commissioned by President Thomas Jefferson), they were accompanied by a Newfoundland called Seaman. 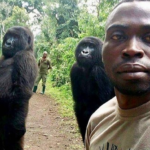 He served as a hunter and guard dog; during one memorable incident he ran off a rogue buffalo that charged the camp. Several Lewis and Clark monuments across the U.S. feature Seaman. Who wouldn’t want to travel with one of these big babies, like 5-month-old Baisley below?